Fall is peak time for catching striped bass in Virginia. Known locally as rockfish, the striped bass is an iconic species of fish in region. Striped bass are caught using a wide range of fishing techniques including chumming, live bait fishing, jigging, casting, and trolling. Some of the best fall fishing begins in rivers as striped bass begin to move towards the open Chesapeake Bay. In Virginia, the Potomac, Rappahannock, York, and James rivers are known for their striped bass fisheries. During early fall, river and creek anglers are likely to encounter single fish or small groups. As the days shorten, striped bass form schools, some of which can be quite large. Shoreline fishing is one of the most popular ways to catch Chesapeake Bay striped bass in the fall. When targeting shorelines, anglers often seek out structure such as points, creek mouths, and aquatic grass beds. Tides usually have a strong influence on shoreline fishing, with most anglers preferring a strong incoming tide or the first of the outgoing tide when rips form. A number of fishing piers in Virginia are located along fall migratory routes of striped bass. In addition to their prime locations, several fishing piers are equipped with lights which attract striped bass at night. 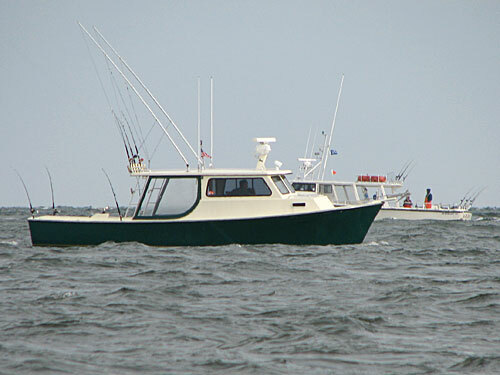 Shoals and sand bars are natural formations that attract striped bass and other game fish. When shoal fishing, anglers use a variety of techniques. The lower Chesapeake Bay is home to scores of artificial reefs, oyster reefs, and natural structures that act as fish havens. Many of these areas are prime spots for catching striped bass. Bridges are known for being top producers of striped bass. Some of the best structures include the Chesapeake Bay Bridge-Tunnel (CBBT), Hampton Roads Bridge-Tunnel (HRBT), and the James River Bridge. Striped bass fishing along bay’s shipping channels begins to pick up in the fall and continues into early winter. Around Thanksgiving to early December, southbound stripers reach the channel edges along the Virginia portion of the Chesapeake Bay. It is during this time frame when ocean run fish often enter the bay. The result can be pandamonioum as stripers prey on menhanden and other forage species, often in numbers that are beyond belief. These feeding frenzies are sometimes accompanied by spectacular displays of gannets diving to feed on baitfish.